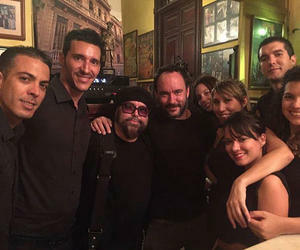 The renowned musician Dave Matthews arrived in Havana before the rest of the US delegation that will visit Cuba from Monday. His exchange with Cubans began last night at La Guarida restaurant, according to a photo posted on his Facebook account. Grammy Award winner shared there with the Cuban singer-songwriter Carlos Varela and his friends. Dave Matthews, leader of the band with the same name, was expected to arrive on Monday 18 as part of a delegation of more than 50 members and guests of the President's Committee on the Arts and Humanities, supported by the White House to strengthen cultural ties with Cuba. Among the artists who come to this initiative are Usher, William "Smokey" Robinson; the Indian-American actor Kal Penn; Cuban- American Lourdes Lopez, artistic director of Ballet of Miami, among other important figures of American culture.